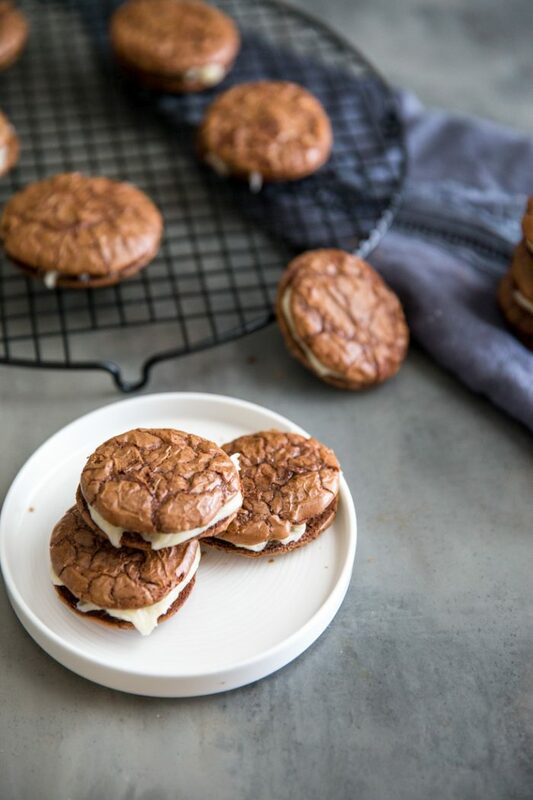 All the flavors of Tiramisu in little sandwich cookies! 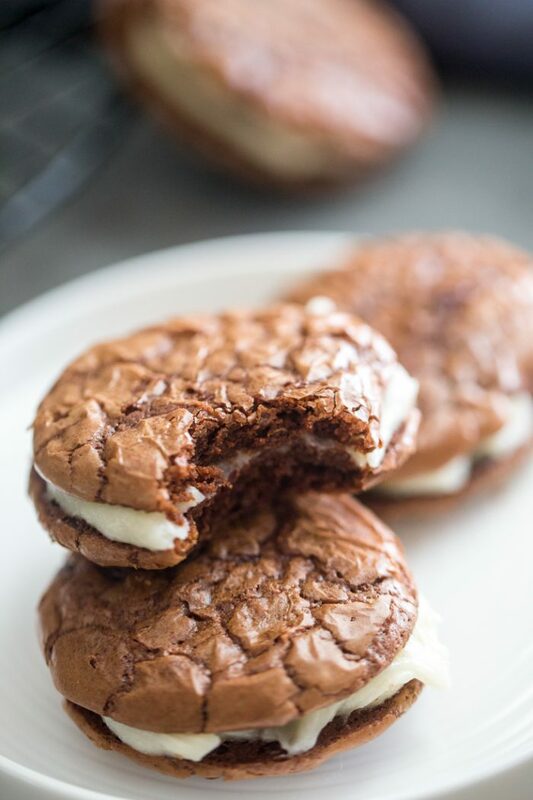 These cookies take a famous dessert and package them into portable, bite-sized treats that will cure your dessert cravings! Tiramisu is a layered Italian dessert that, when translated means, “little pick me up”. Why does it have that meaning, you ask? Well, I’ll tell you! Tiramisu is made by taking ladyfingers which have been soaked in a boozy coffee mixture and layering them with a creamy (also boozy) mascarpone layer. Cocoa powder is dusted in between and top along with a generous amount of chocolate shavings. Between the coffee, the liqueur, the cocoa powder, and the chocolate, it is impossible to avoid getting a little “energy” boost from this dessert! Tiramisu is my husband’s FAVORITE dessert, it’s the one thing I turn to over and over again because it’s really a no-fail recipe, it always turns out and my husband is always happy. But, I have to admit, sometimes I get tired of making traditional Tiramisu, so I change up the flavors and make Lemon Raspberry Tiramisu, Maple Tiramisu, or even Tiramisu Pudding Shots. 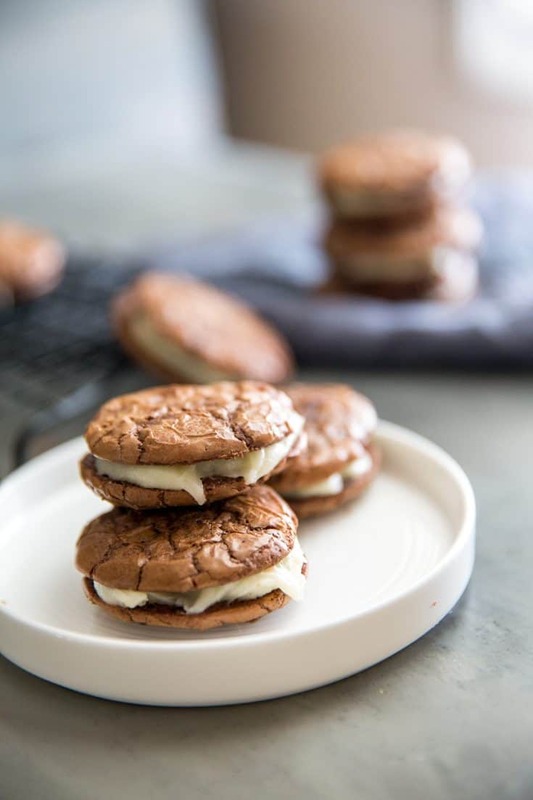 And now I have these sweet little sandwich cookies to add to my Tiramisu roundup! 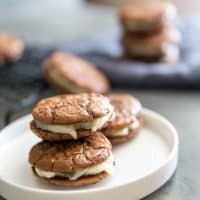 WHERE IS SANDWICH COOKIE RECIPE? 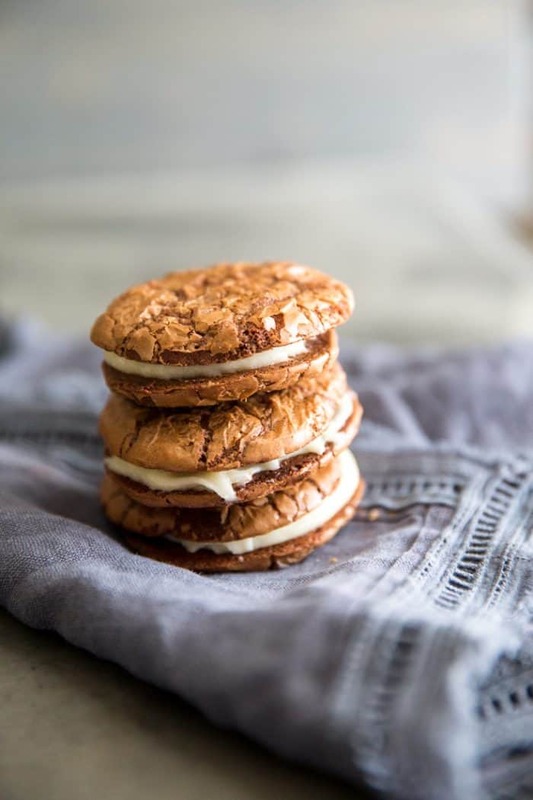 If you’d rather skip cooking tips, suggestions, handy substitutions, related recipe ideas – and get straight to the Tiramisu Sandwich Cookie Recipe– simply scroll to the bottom of the page where you can find the printable recipe card. Sandwich cookies are little cookie rounds (any kind) that are held together by filling. In this recipe, I made a batch of fudgy brownie cookies that have been enhanced with a little espresso powder. I find that a little espresso powder in chocolate desserts intensifies the chocolate flavor, it tastes deeper and richer. In keeping with the traditional Tiramisu, the filling for this recipe is made with mascarpone, cream cheese, powdered sugar, and a little Kahlua liqueur. Mascarpone is a soft, Italian cheese that is mild in flavor and texture. It is like cream cheese, but a little softer. The cookies WILL flatten while baking, don’t be alarmed. To prevent the cookies from spreading too much refrigerate the cookies on the baking sheet for at least 15 minutes. That little bit of cold air will help the cookies retain their shape. Be sure the cookies rest on the baking sheet for a few minutes before removing them to a cooling rack. The cookies will be very tender and will fall apart easily. The mascarpone is the dominant ingredient. Both the mascarpone and the cream cheese will need to come to room temperature before you begin mixing. If you cannot find mascarpone, you may use all cream cheese for the filling. Add a little powder sugar into the cheese mixture a cup at a time until the mixture is spreadable. Kahlua is added for flavor, but it can be omitted or you can substitute rum or brandy. Coffee or coffee extract would be fine as well. Since these cookies have a dairy-based filling, I recommend storing them in an airtight container in the fridge. They should last 3-4 days. I would not recommend freezing these cookies, the mascarpone will not freeze well. Want more Tiramisu ideas? Try Cake with Mascarpone Buttercream, Strawberry Cheesecake, Strawberry Tiramisu! In a small bowl, combine flour. Baking powder, salt and espresso powder. Set aside. In a mixing bowl, beat together eggs, sugar and vanilla until mixture begins to thicken. Stir in cooled chocolate mixture followed by flour mixture. Beat until combined. Fold in chocolate chips. Let batter stand for 10 minutes in order to thicken up. Preheat oven to 375. Drop dough by tablespoon full about onto a lined baking sheet, keeping each cookie about 2 inches apart. Bake for 8 minutes or until edges are set and cookies are slightly cracked. Let cool for 1 minute before removing to a cooling rack. Beat together mascarpone and cream cheese. Add in powdered sugar, vanilla and liqueur. Spread a healthy tablespoon of filling on the flat side of one cookie, top with another cookie. Makes 12 sandwich cookies. Store assembled cookies in an airtight container. Cookies will spread while baking. To minimize spread, place cookies on baking sheet and place baking sheet in the fridge for 10-15 minutes. I love Tiramisu and if I can get it into my mouth quicker with these cookies then I’ll take a dozen please! Pinning! I love how these cookies look crackly, but I know that they’re fudgy on the inside! Great flavor combo! Thats exactly right Kari! Thank you! That first photo is GORGEOUS Tanya! I want these in my belly like right now! That Kahlua filling sounds to die for! 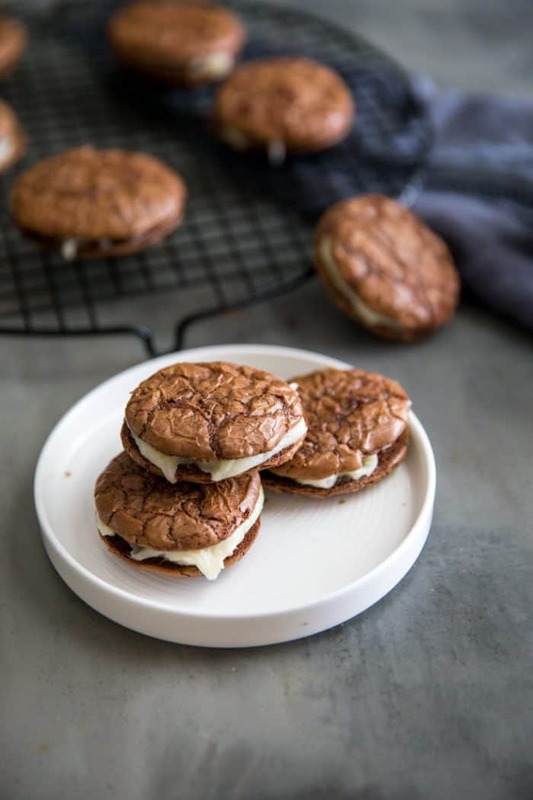 I adore tiramisu so can only imagine how lovely these cookies are. The filling looks to die for!! And maybe the 5 minute away nursery isn’t so bad- getting your tree up in an hour?! Score! Liz, I think only spending an hour on the tree was the best thing! I love Tiramisu too! Oh. My. GAHHHHHHHH Tanya. These cookies! Lovvvvve. We live right next to the NC mountains where the nation’s best Christmas Tree farms are located (this is where they get the white house tree!) and we have never cut our own lol. But in my mind the nostalgia is wandering a tree lot run by the farmers that drive them down from the mountains, everything all lit up with Christmas lights PLUS those guys will tie it to your car for you. Mission accomplished. There is something to be said for not having to tie down your own tree. That is my husbands least favorite part. Lots of cursing and crumbling takes place. I had visions of the movie Christmas Vacation going through my head as I read this Tanya!! I love that movie, and I have never even considered cutting down my own tree that far away from home because of it, lol. 😉 These cookies are definitely not a chore, and well worth enjoying…instead of chopping down a tree! Agreed! No more chopping-much more eating! Thanks Lisa! These look delicious, Tanya. Seriously, I want to eat like 20 of these sandwich cookies! I could probably eat 20 too! Thanks Nicole! Lisa, he reads all my posts (by request from me) and I KNOW he’ll remember my words! Thanks for your compliment Lisa! The farm is wonderful, but I think we found our new way to get a tree! So much easier! No offense meant to the Oreo company nor their supporters but THIS is the way sandwich cookies should be made. They sound wonderful, Tanya. Thank you John. I don’t think I can eat an Oreo again! We get a live tree every year too….but it has changed over time. We used to all go to a tree farm and chop one down, then just Jorden and the girls went…..now I just send him to a lot where they are already cut 🙂 Oh well. More time to make these delicious little bites is perfect…..I adore tiramisu and need to try these!! These sound sooooo good! I’m a tiramisu fanatic too, and love this twist on one of my favorites! Thanks Kelly! My hubby is a big fan of tiramisu too. I’m a big fan of Kahlua! I am so loving your recipes! I have just been in heaven looking at them all. I like to switch all my recipes around too. It just depends on what kind of mood I am in! WOW Tanya! These look fantastic!! I am not a fan of Tiramisu (the whole espresso thing), but oh my goodness. I might just have to try these because they look too good not to! You could leave out the espresso and they’d still be awfully tasty! 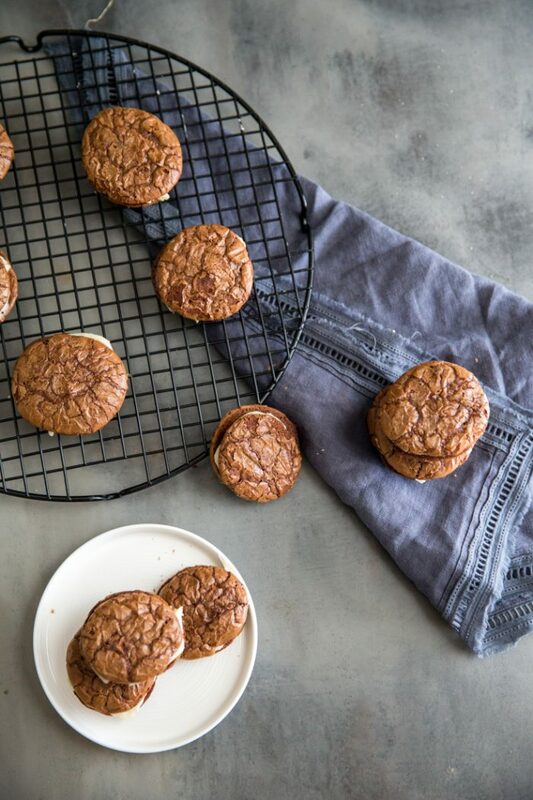 I’ve had trouble before making actual tiramisu, so I love your much easier cookie version! Thanks Carly, these were much more portable and easy to share! Oh my! I love the sound of these cookies. All the yumminess of tiramisu without all the work. Awesome. This looks absolutely amazing! 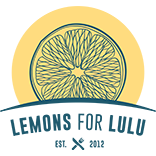 Many thanks for the share, I will definitely give it a try over the weekend. I was wandering around stumbleupon and landed on these. Thought I’d tell you I still LOVE them!